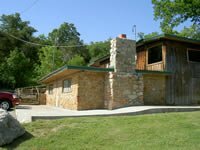 Located in the heart of the Arbuckle Mountains, the Deer Creek Lodge north of Ardmore is ideal for any size group. 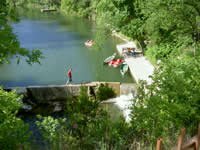 Located half a mile from Turner Falls, two miles from Rose Grocery and canoe trips, three miles from Falls Creek Baptist Conference Center, two miles from Camp Classen YMCA Camp, and only 15 minutes from the Chickasaw National Recreation Area and Arbuckle Lake, you’ll have so much to do during your stay, you won’t know where to start. 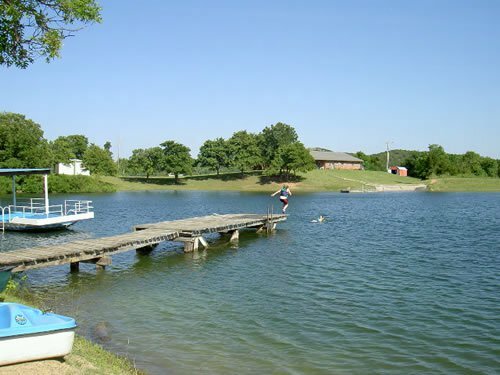 You can hike, fish, paddleboat or canoe around the lake during your visit to Deer Creek Lodge. If you like sports, you can play horseshoes or volleyball while enjoying a late afternoon lunch in one of the picnic areas. Each of the five lodges has a commercial kitchen with grill, oven, electric burners, microwave, coffee makers, refrigerators, and an outdoor smoker and cooker. Cabins one through four each have two restrooms with showers. In cabins one and two, there are eight futons on the main floor. In cabins three and four, there are ten futons. Lodge five has two private rooms with beds, three bathrooms, 16 futons, and a large downstairs area as well as two fireplaces and a large deck. The lodge is also near a RV park in Davis. From I-35, take Exit 51. Travel south on Hwy 77 to Junction 77D (1/8 mile), then turn left to office.